The recession gripping the world’s automakers hadn’t hit when product plans for many vehicles were hatched several years ago. That means this year’s Geneva auto show, which takes place March 3-15, will have more world debuts than should be expected during such dour times. From minivans to crossovers, from basic transport to high-end luxury cars, the 79th Geneva show will feature at least 30 world debuts of vehicles and technologies. They include much-anticipated introductions of the VW Polo, Peugeot 3008, Mercedes-Benz E-class Coupe, Fiat 500 Cabriolet, Chevrolet Spark, Aston Martin V12 Vantage, Opel Ampera plug-in hybrid, Renault Scenic and Grand Scenic, and two models from Audi. Concept vehicles from Ford, Citroen, Nissan, Hyundai and Kia also will make a splash on their stands. Here is a sampling of a few of the vehicles taking their bows at Geneva next month. The redesigned Polo, Volkswagen’s second-best selling model, will be one of Geneva’s most important debuts. The original Polo was launched in 1975, a year after the original Golf. 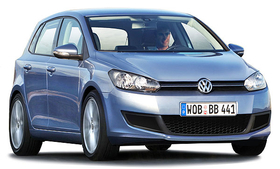 The new Polo will be the model’s fifth generation. capacity. Succeeding the current Polo BlueMotion diesel with CO2 emissions of 99 grams per kilometer, the new Polo BlueMotion diesel will emit only 88g/km, VW sources say. The redesigned Polo goes on sale in Europe starting in late summer. 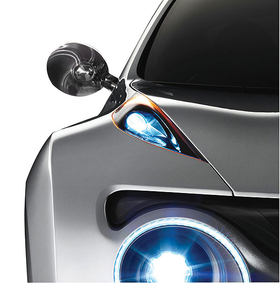 Nissan will show a small crossover concept car called Qazana. The four-door model shows how the production model, planned for introduction in 2010, could look. The Qazana will complete the Nissan crossover portfolio which comprises the medium Qashqai and Qashqai+2, and the large Nissan Murano. The production version of the Qazana will be built alongside the Qashqai and Note small minivan at Nissan’s Sunderland, UK, plant. The Qazana and its production variant are based on the Renault-Nissan alliance B platform. The Qazana concept features four doors, with the rear doors opening rearward for easier access. The design is rather boxy, in line with vehicles like Toyota Urban Cruiser, Kia Soul and Citroen C3 Picasso. Based on the 5-series platform, BMW has developed a new concept for a five-door premium hatchback. BMW describes it as a Progressive Activity Sedan and calls the model Gran Turismo. The concept GT is designed like a four-door coupe, with frameless side windows. A large two-piece tailgate gives access to a luggage compartment that can be enlarged from 430 liters when all four seats are occupied, to 1650 liters when the rear seats are folded down. As shown in Geneva, the GT is still a styling concept. No technical details will be unveiled. A production version is expected to be unveiled at this autumn’s IAA in Frankfurt, with an on-sale date in the fourth quarter of this year. Rolls-Royce will display the EX200 concept car, which will be smaller than its Phantom sedan. The concept, seen in a spy shot, will preview a “baby” Rolls-Royce sedan due to go on sale in the first quarter of 2010. Some sources suggest the historic Silver Ghost nameplate will be used for the model, which will be built alongside the Phantom at the company’s Goodwood factory in West Sussex, England. Kia will show a concept for its new small minivan. The production version of the car, code-named YN, will be built at the Hyundai factory in Nosovice, Czech Republic, later this year. 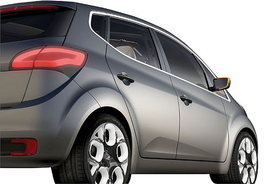 The minivan will be based on an enhanced version of the Kia Rio platform. It will go on sale toward the end of 2009. The concept was designed by Gregory Guillaume, Kia’s chief European designer.